Info: Signed in full by the author in purple ink on limitation page. This specially bound & boxed edition of Foundation & Earth by Isaac Asimov commemorates his 100th book published by Doubleday & Company, Inc. This edition is limited to 300 autographed copies. This is copy 49. This is the fifth book in the author's Foundation series. 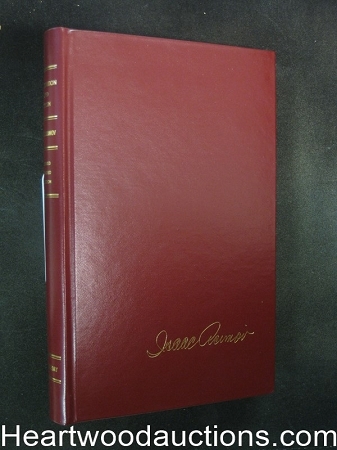 Full red leather with gilt-embossed facsimile signature to front cover, gilt lettering to spine, all edges gilt, red silk ribbon page marker, printed end papers (with Asimov titles), illustrated color frontispiece, housed in publisher's matching full red leather slipcase. Gorgeous copy.